At noon the line began to form. 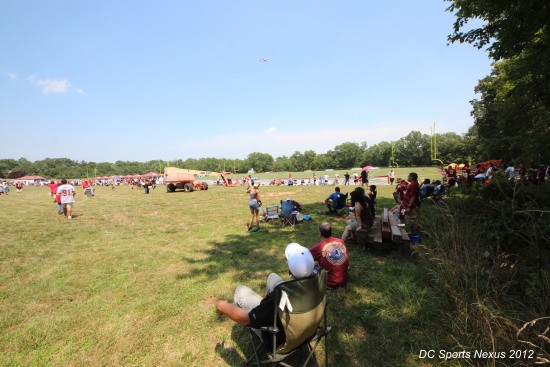 Redskins fans arrived early to stand out in the heat and wait for the gates to open at 1pm so they could secure their spot close to the field. 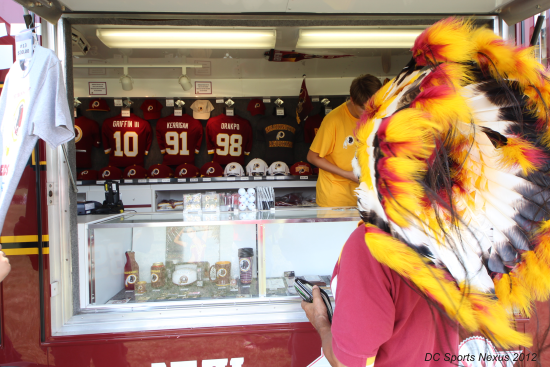 Signs, costumes, and jerseys of players that were no longer on the team, along with the new #1 jersey, RG3 standing...waiting...for a practice. 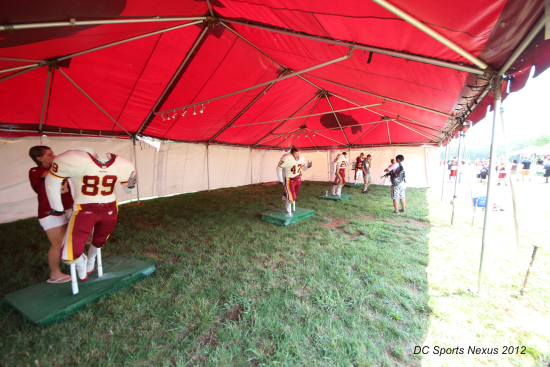 Camp wasn't even supposed to start until 3pm, but the chance to possibly get an RG3 autograph was enough to have people standing around burning alive for over 5 hours. 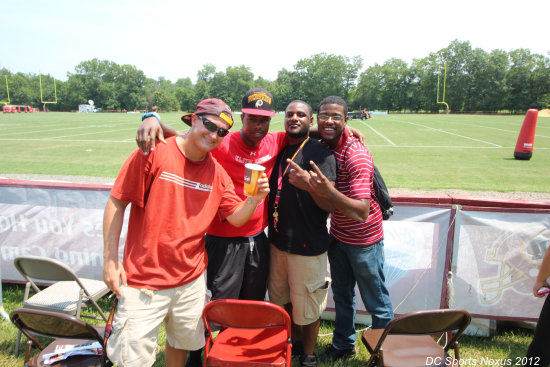 Dan Snyder's propaganda team was in full effect blasting Hail to the Redskins on repeat for the entire 2 hours before practice. 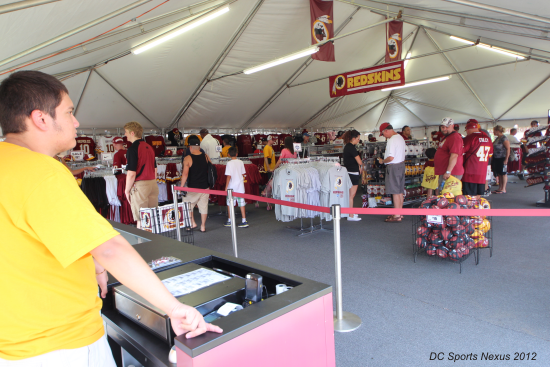 There was a merchandise tent as well as a merchandise truck locked and loaded with overpriced merchandise. 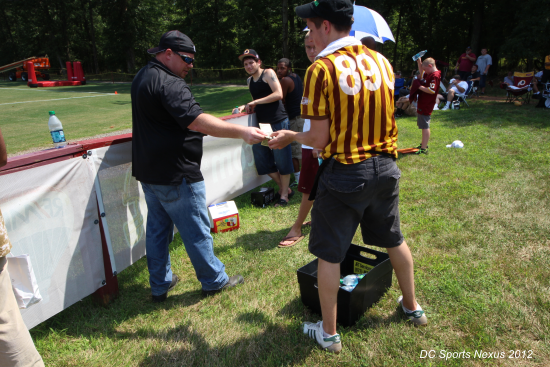 The prices didn't stop hundreds of fans for dropping some cash for gear with their favorite team logo on it. I walked past one fan who was smiling like a child at Disney World. He remarked to his friend, "this is the best day of my life, I've been waiting for this for so long". 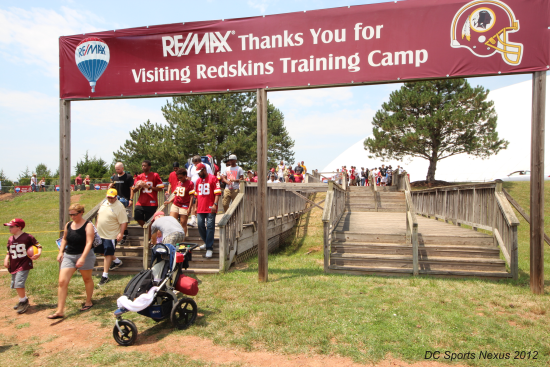 While he was clearly over-exaggerating, his sentiment marked the mood of the fans at camp. 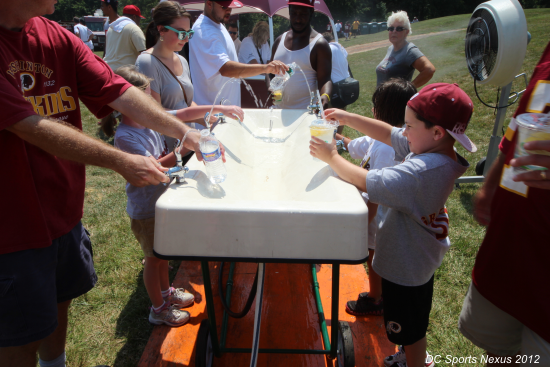 With games being expensive and the game experience being awful, fans who can not (or will not) afford to go to a game got to experience the Redskins up close and personal. The real story of camp was the weather. The temperature didn't stop Mike Shanahan from having his guys practice over 2 hours. The heat was staggering. There were few shaded places and a tiny 10x10 "cooling tent" but even in those places the temperature was unbearable. A 15 year old kid collapsed of heat exhaustion (he's fine) and a few other people walked themselves into the paramedics tent with heat related issues. I guess those people didn't buy waters from the "beer man" selling $3 bottles. When camp was over the fans crowded the fence to try to get autographs. Guys like Chris Cooley and Fred Davis hung out for awhile making sure to get everything signed. As soon as RG3 walked towards the crowd it was almost as if Cooley didn't exist. 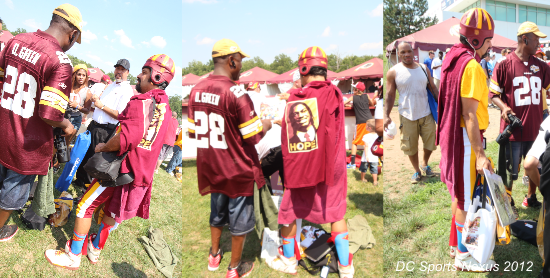 Redskins training camp was a fun event for die hard Redskins fans and it was the official beginning of RG3-Mania.